Hamish is larger than life - and just a little bit clumsy and a tiny bit messy. 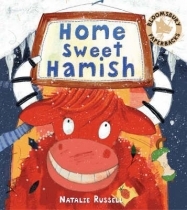 Hamish is clumsy just once too often and his animal friends banish him from their house. But it is cold and snowy oustside and soon the animals start to feel guilty. So they come up with a perfect plan to make Hamish feel very welcome indeed. This is a charming picture book with a reassuring message about friends overcoming problems together.